The Primary Label is the default view, and to view messages assigned to the social and promotions labels you need to click on the appropriate tab. see How Gmail Organises your inbox. Note: If you disable the default label tabs then all messages will appear in your inbox. Unread messages are shown in bold and previously read messages are marked as read by displaying them in normal type. To read an email click the message and it opens so you can read it. The reply,reply to all and forward text are links. Click on the appropriate link. 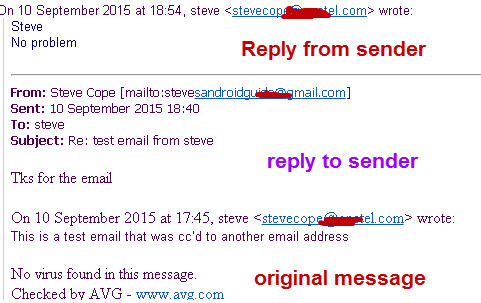 Reply-replies to original sender reply message will include the original message, but it can be removed. Reply All – replies to original sender,and any other recipients (contained on to or cc lines) .The reply message will include the original message, but it can be removed. Forward – Sends original message and any attachments to to other recipients of your choosing. 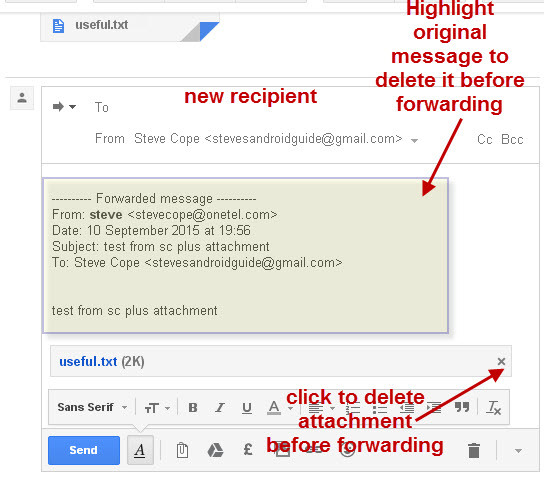 You can remove attachments before sending and remove the original sender address. You can edit the subject, ,but It is not usual to change the reply subject as it is used for grouping the messages by conversation. Changing the reply subject you start a new conversation! 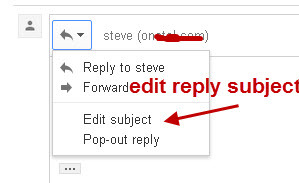 However you can change it, if you really want, by clicking the down arrow next to the recipient address and click edit subject. A larger message window opens showing the entire reply message which,by default, includes the original message, and any previous reply messages. You can remove the original messages from the reply by using the edit subject option which gives you access to the entire reply message. Note: Changing the reply subject and deleting the original messages from the reply is not normally done. You can also add new recipients to the to, cc or bcc fields by clicking in the address bar. 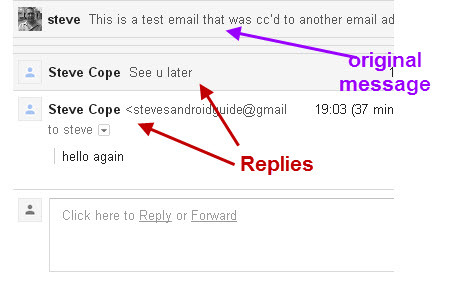 You can also add attachments to a reply message, just as you do when sending a new message. A series of message exchanges with each recipient using the reply option can result in a long message thread. If you open a message that has multiple replies you will see the original email at the top and your replies underneath. the message thread is expanded. This shows too much detail but if you click again to collapse the thread, then the view shows the replies grouped by sender. 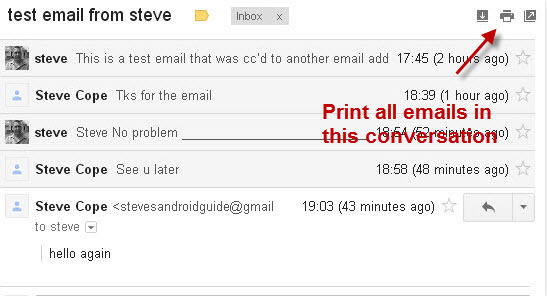 You can also easily print the emails in the conversation by clicking the print icon. Note: if you don’t like the conversation view you can turn it off by going to settings>General and conversation view. If you forward an email then you need to enter the new recipient address in the to field, and you can cc or bcc the message just as you can with any other message that you send. When you forward a message the original message and any attachments are forwarded, but you can remove the attachment before forwarding if you want. Important!- Don’t forward large attachments unless you really need to. To delete the original message from the forwarded message highlight the message and click the delete key. 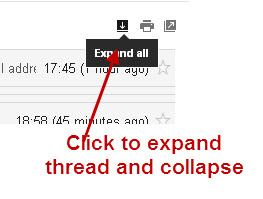 To remove an attachment before sending click the x to the right of the attachment as shown in the screen shot above. If you want to change the subject line when on forwarded messages then click the down arrow next to the recipient address and click edit subject. A new window will open with the message displayed and you can edit all of the fields. If you find the text too small then you can change the text size of the browser by using CTRL and [+ or -]. Q-When I reply to a message is the original message included in the reply? 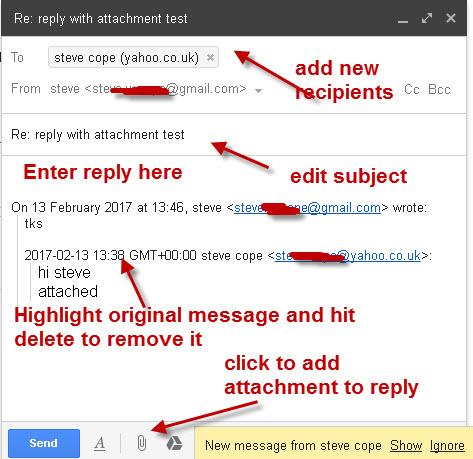 Q-When I reply to a message with attachments what happens to the attachments? A- The Attachments are automatically included in the reply, but you can remove them before sending. Q-When I forward a message with attachments what happens to the attachments? Q- When I reply or forward email can I add new recipients? A Yes you can add new recipients to the to,cc, and bcc fields.